Finally, able to make a proper post about my trip. What a great game to be at. The Mrs. really outdid herself. My wife and a couple of our friends got a really nice AirBnB and we all drove up from Kentucky. Went to the Mall of America, drove around the various parks, and ate some great food. Seeing people clad in Vikings gear everywhere and stores with Vikings stuff was super weird – in a good way. The highlight (aside from the game, of course) was the stadium tour. We took the tour on Friday and there’s good reason people here have been so positive about it. We got to go to all of the various suites and clubs and look around. Got to go into the press box. 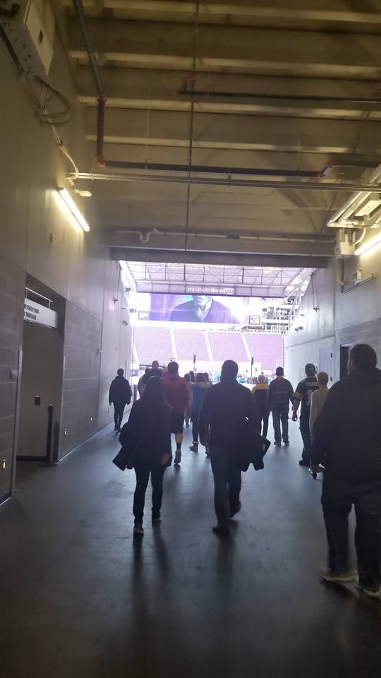 Learned about the stadium itself and how the ceiling works. Walked through the entire stadium just about in an hour and a half. Just a really cool experience overall. Then there was game day. We spent a little time out at the tailgating area but it was snowing so we didn’t stay out too long. We had actually planned to try to tailgate ourselves but it fell through. The snow made me feel much better about that! Something to understand about me; I grew up … unwealthy. So, even going to a game at USB seemed like a foreign idea as the tickets can be pretty pricey. Though my wife and I are financially solid now, my brain still defaults to “that’s too expensive” about anything over $50 bucks. I lead with that to help understand the level of excitement I felt just going to the game in general. Then, however, to learn what “Club seats” actually means. I just assumed it was a section of seating on the field. Better views or whatever. Imagine my surprise on the tour when I find out club seats mean you get access to an actual club! A limited number of people have access to bathrooms, specialized vending, huge TVs everywhere, seating, etc. We weren’t quite fancy enough to get the high-level club where everything is paid for – food, drinks, etc. (maybe one day) Nonetheless, super impressive setup. I’ve been to a few away games that are closer to my area and this was my first home game. Having so many Vikings fans around cheering the team on was amazing. Making noise while the other QB is trying to direct the offense. A sea of purple in the stands. The Skol chant and song. Just stuff you don’t get when you’re at an away game. Of course, the game was great to watch. 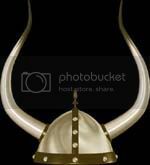 The Vikings did really well and the Cardinals never really had a chance but kept it interesting. I won’t go into much detail about the specifics there because we have another thread dedicated to that. If you ever have the chance to go to USB and haven’t been – do what you can to go! Nothing like it Cliff! It's pretty expensive when it comes to food and buying gear but that comes with most stadiums. It's an awesome experience overall. I've gone 1-2 times a year since the new stadium has opened and will continue to do that. Me and my buddy try and see a new team play every time. Every time I go, I'm like a kid in a candy store. Every experience seems like my first time being there. I love it. With me being from and living in New York, I hardly ever see Vikings fans. Me and my buddy Nick are just about it around here for Vikings fans. However, going to Minnesota and seeing everyone in purple and "on your side" not booing you is pretty cool. But honestly, the number one thing about that trip that I love most, is the people of Minnesota. I've been 4 times now, going on 5 next week and everyone I meet whether its at the stadium or outside are awesome. I've also never once seen a fight since I've been going. I've been to a million games in Buffalo and I've seen a fight at just about every single one. Buffalo fans booing anyone and everyone with a different colored jersey on. You just dont see that in Minnesota. 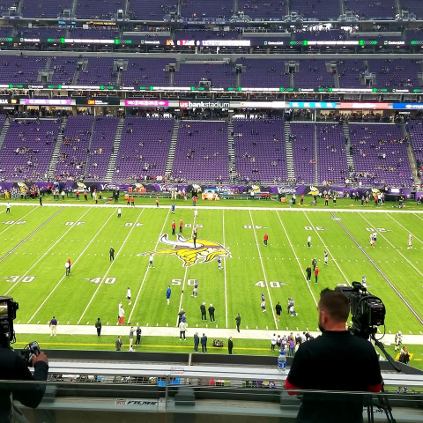 Unfortunately, I was at the Vikings/Bills game this year with Nick. First time I've ever seen them lose in Minnesota. However, next week is my bachelor party. I'm getting into Minnesota friday morning. There will be 9 of us. 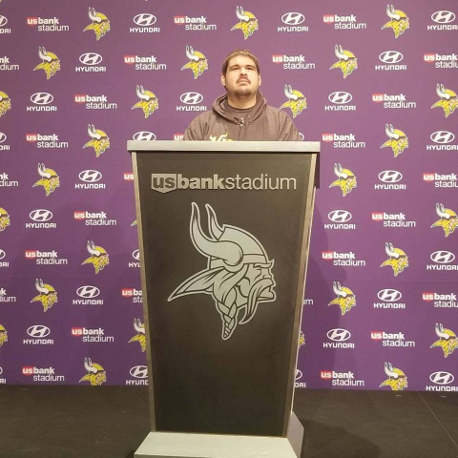 Friday night, we are going to the T'Wolves/Bucks game, Saturday night we're going to the Wild/Avalanche game and then Sunday Night Football Vikings/Saints the following night. So hopefully I bring much better luck to the Saints game than I did the Buffalo game. Awesome write up, Cliff. Enjoyed your response, too, PHP. Not much to add, except that I was nodding to everything you both wrote. 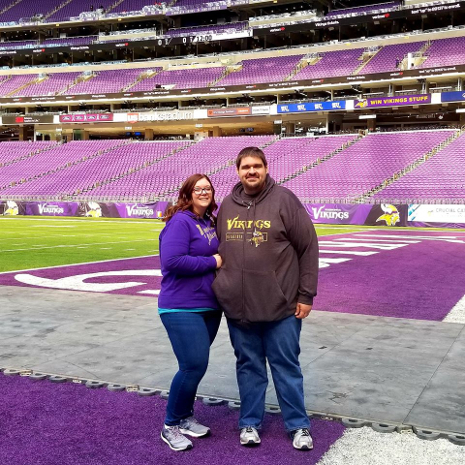 I went to my first Vikings game last year with my brother who lives in NJ. We grew up outside of the Twin Cities and in one of the first photos we have of us we're dressed in Vikings pijamas and winter hats. The playoff game vs. the Saints turned out to be historic, of course, so to be there with my brother was magical. I nodded very strongly, PHP, to your comments about Minnesotans. I miss my people! Walking to the stadium while it snowed we ran into this lady who really wasn't a fan of the NFL but she lived near the stadium and she went out of her way to show us the way. She was so kind and fun--reminded us of friends of our parents from growing up. PHP: sounds like you have a heck of a bachelor party lined up! Enjoy it! And congrats on the coming nuptials. Thanks brother I cant wait! 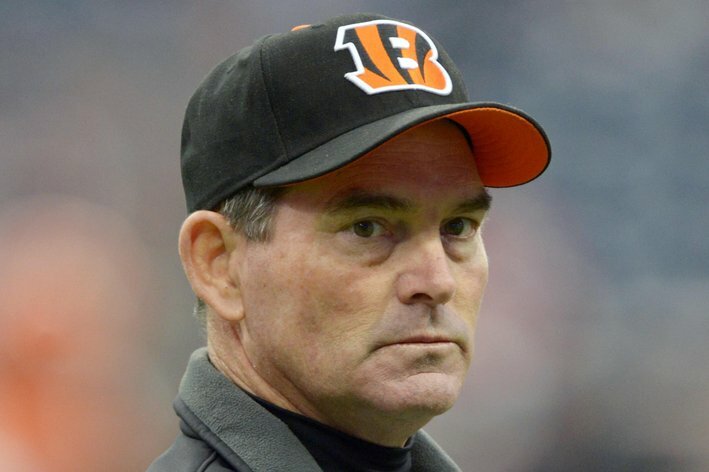 I just want to beat the Saints. Because I cant stand them. Man, your first Vikings game was the playoff game last year? You literally picked one of the best games in NFL history to go to. That's pretty awesome! Yeah, it was nuts. We've been through all the let downs, so when it looked like it was going to be another one I wanted to just puke. Then Diggs caught that ball and took it to the house. Collective euphoria ensued thereafter for several hours. Unforgettable experience. 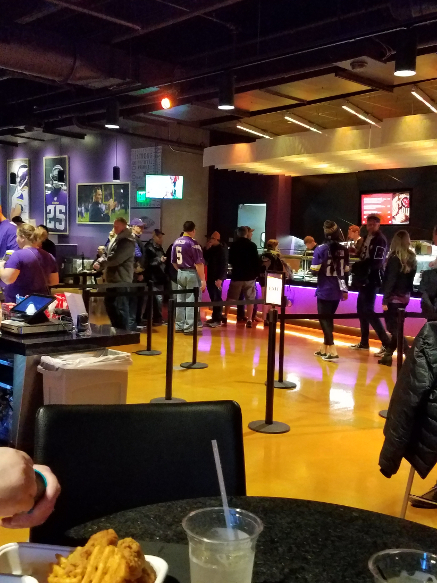 Seeing people clad in Vikings gear everywhere and stores with Vikings stuff was super weird – in a good way. This! It's a small miracle to see another Vikings fan where I am for obvious reasons so seeing a sea of purple was surreal. I'm glad you had a good time and was able to see a win. You're lucky you got to go in the press room too, we didn't get to do that on our tour. Can't wait to get a chance to go. My first "Home" Game was at the old "Met". Yeah, cold. It was a Bills games. My next "home" game was in the Humpty dome. Don't remember the team but it was the first year it opened. College frat brother father worked for the company that built it so we got free tickets. Now I need to see one in this stadium. Glad you had a good time. And oh yeah, the Mall of America, it sits on the property that once housed the "Met". Oh nice! I'm from Watertown, NY, way upstate. 1 hour north of Syracuse. I'll be around Minnesota from Friday morning to Monday night so maybe we could meet up at some point! That's awesome. Glad you had an amazing experience. However, it didn't detract too much from what was an amazing experience. We got to tailgate with a few members of the VWO, were given VIP passes so we got on the field during the players practice and best of all, were sat in a heavily VWO attended part of the stadium. So the atmosphere was incredible. I go to many Leeds United away days back here in the UK, and we are known for being one of, if not the most noisy sets of fans in the game. The noise at the Bank was very similar. With how vocal the fans were, plus the enclosed stadium, it was unbelievable. We're already trying to save to come back for another game. The fact that Minneapolis is such a great city, helps this as well! Thanks for sharing your stories, everyone, it's been fun reading them. I definitely agree with you, PHP, the people in Minnesota were all very nice. Good luck on meeting up, guys. I was thinking about trying to do some kind of message board meet up at a game next season. Ya know, I thought about that a while back but wasnt sure how realistic it was so I never mentioned it. But it would be cool to get together and meet some of the guys on here. Enjoyed reading all of you guys stories,very cool that Vikings have die hard fans from all over. My daughter went to the Jets game yesterday as she lives close by in Connecticut, she said that she was treated well by the opposing fans and had a great time.Makes for a lot better experience when you don't have to have your head on a swivel like we did in Philadelphia last year.